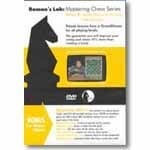 This DVD features the first five lessons of GM Roman Dzhindzhikhasvili's Mastering Chess Series - Learning Openings the Easy Way. Traps and Novelties. Lesson 1: Learning Openings the Easy Way - Guide to worry-free openings, based on understanding rather than a memory contest; Lesson 2: Avoiding & Creating Opening Traps - The secrets to avoiding and creating opening traps without damaging your position; Lesson 3: Dangers & Advantages of Choosing Sharp Openings - Tactics you can't live without in sharp modern openings; Lesson 4: Punishment for Delaying Development in the Opening - Punishment meted out for typical materialist at the expense of development; and Lesson 5: Creating Opening Novelties - Important updates on a number of novelties introduced in previous Roman Forum tapes. Roman covers the following openings on this DVD: Caro-Kann, Ruy Lopez, Benko Gambit, Tarrasch Defense,Sicilian Defense, Accelerated Dragon, Queen's Gambit Declined, English Defense, Scotch Gambit, Nimzo-Indian and more!